I put together a comprehensive guide on where, when, and how to elope at Cannon Beach on the Oregon Coast. Intimate weddings and adventure elopements are becoming more popular these days but picking your special place and coordinating how to do it isn’t always easy. There are so many wonderful, beautiful places to elope in Oregon and the Pacific Northwest but none easier than Cannon Beach. Below you will find some location tips for your Cannon Beach wedding ceremony, recommendations for what times are best, and suggestions for places to celebrate afterwards. Do you have a secret spot or have a tip on some great places for couples to eat after their wedding day? Let me know and I’ll add it to the list! I’ll be updating this as I go along, sharing new photos and other suggestions. Learn more about my elopement photography packages here and see more of my wedding work here. This is one of my favorite places to elope at Cannon Beach. Located on the northern stretch of the beach, across from Ecola Creek, is Chapman Point. Depending on the tide you can access the cove at the tip of Chapman Point which can be a quiet place for your ceremony. If you’re feeling adventurous, you can scramble up the rocks and have your ceremony on the bluff above. There is a small parking lot with a restroom on 5th St and for closer access to the point there is a small amount of street parking on Oak St. Thanks to its distance from the more popular areas of Cannon Beach, Chapman Point can sometimes be a little less busy. The focal point of Cannon Beach is undoubtedly Haystack Rock and what better place to get married than at the base of it. Getting close to the mammoth sea stack is a short walk from either the town of Cannon Beach or a slightly longer walk from Tolovana. Both of these areas have ample parking and access to restrooms. The most convenient public parking is located at the intersection of S. Hemlock St. and E. Gower Ave. Once parked you can walk down Gower Ave. to Ecola Ct. and get ride on the beach. To get even closer to the big rock you can head further south down S. Hemlock St. but services (parking and restrooms) are tricky. At the southern end of Cannon Beach is a location called Silver Point. It’s a rocky stretch of beach with a smaller, yet still impressive sea stack. This part of the beach is definitely not as popular as the other spots and is a little tricky to access but it could be the perfect place for your elopement. Use Google Maps to find a side street that has access to the beach otherwise be prepared for a long walk on the beach from Tolovana. This isn’t technically Cannon Beach but it does deserve a mention. Drive south down Highway 101 about 10 minutes and you'll find a small state park called Hug Point. It’s a beautiful rocky part of the coast with craggy ledges and coastal caves. There is a small parking lot that fills up fast in the Summer months and restrooms are on site too. The view from Ecola State Park is breathtaking. It looks down on to Crescent Beach with Cannon Beach and Haystack Rock in the distance. Depending on the size of your elopement and what you’re looking for it could be great. There is a decent sized parking lot that is $5 for the whole day. Unfortunately due to erosion one of the lookouts and several of the trails are closed which means reaching a more isolated or undeveloped spot with that epic view is off the table. 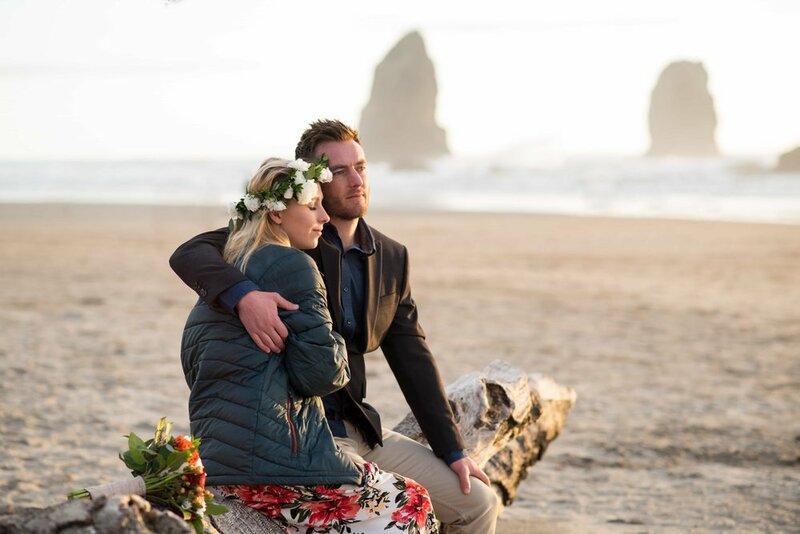 The best time to get eloped at Cannon Beach is definitely during the week and in the morning or early evening. Cannon Beach in the Summer is a busy place and unless you want your wedding party to include hundreds of out-of-towners it’s best to stick to the weekdays. Exchanging your vows in the morning or early evening can work lovely for photos too as light is at it’s best. Be sure to check sunrise and sunset times and work with your photographer to pick the best time for photos. Another important thing to keep in mind is what the ocean will be doing when you’re out there. Be sure to check the weather forecast as well as tide tables. At low tide you can access some pretty great places especially near Haystack Rock and Chapman Point but conditions can change quick so be safe out there! The Oregon Coast can be a wet place. All that moisture is what makes Oregon so lush and magical (did you know there are 238 waterfalls in Oregon?!). It also means that there is a good chance your wedding vows may get a little soggy. Embrace it! If you’re looking for sunny beach weather, you might not get it. However, picking a wedding date in July, August, or September will probably increase your chances of sunshine. These are the driest, warmest months of the year but also the most popular. If you do luck out and get a sunny day, avoid having your ceremony in the afternoon when light is at its strongest. Nobody wants squinty photos in hard light. Unless you’re planning on having a big wedding ceremony you probably won’t need a special use permit for your Cannon Beach elopement. Most intimate gatherings that don’t prohibit the public from also accessing the area are in the clear. That being said review the rules by Oregon State Parks and see if they may apply to you and your wedding. You may have the perfect, most well spoken friend who comes to mind immediately when thinking about your wedding day. That’s so awesome! Alternatively, you might be keeping the whole thing on the down low from friends and family and need a professional. Emily of Rooted & Wild and Carolyn of Oregon Beach Ceremonies are both wonderful officiants who help couples create ceremonies that are authentic and unique. They’re both well-versed in elopements, the Oregon Coast, and Oregon marriage law. The Union Knot is a full service bridal salon that specializes in hair and makeup. They’ll have you looking your best on your wedding day. Don’t forget flowers! Pacific Coast Floral Design makes incredible bridal bouquets inspired by the Oregon Coast. After your perfect day at the beach you’ll probably be hungry and ready to celebrate over a good meal and drinks. Thinking about staying the night or making a weekend out of it? Chris Brodell is natural light wedding photographer located in Portland, Oregon. He photographs weddings and elopements in both the Pacific Northwest and the SF Bay Area in a candid and photojournalistic style and creates images that are full love, light, and vivid colors. To learn more about pricing and his approach, visit his adventure elopement photography packages below or complete the contact form. Tell me a little about yourself. What drew you to getting married at Cannon Beach? Why is photography important to you? Have questions? Ask away! Thank you! I’ve received your inquiry and I'’ll get back with you soon. I can’t wait to learn more about you and how I can help document your day at Cannon Beach!